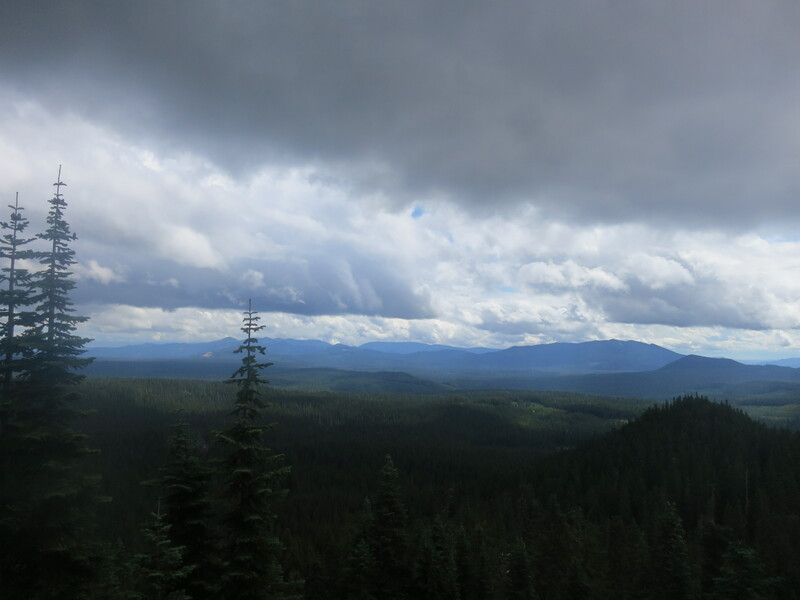 Day 130: More rain, more forest, more exhaustion! I was so exhausted that I didn’t even want to sit up and check whether rain was coming into my tent last night at 10:13! I could barely open my eyes! In the morning, I ate half a ziplock of granola with milk and then had one poptart with my coffee. It was a good combination of nutrition and sweetness! I wonder why it had taken me so long to figure that one out! I started hiking at 7:50. The air was cold and I wore my rain layers as I walked. The trail once again remained in the woods. The lady I had met at the Bridge of the Gods was right! 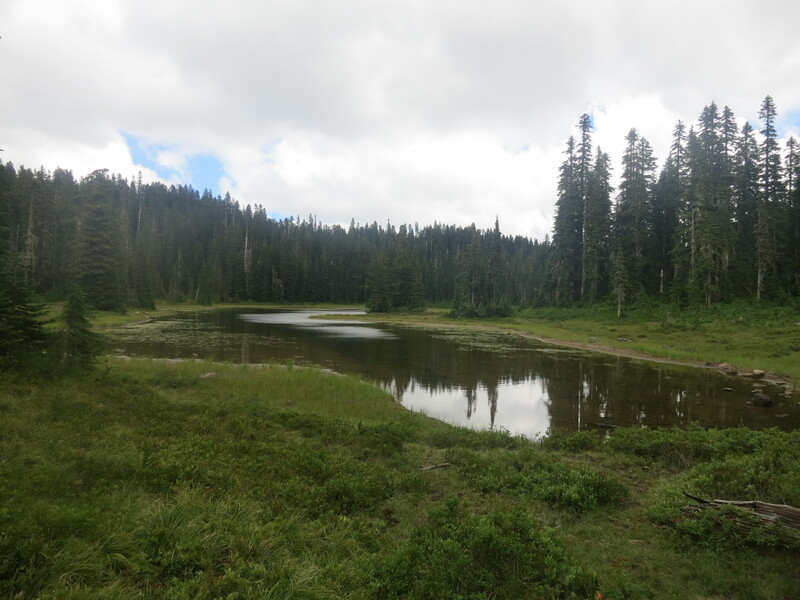 Washington was very forested! I was not expecting this! Immediately after I took a pee break, I reached a camping area with an outhouse! It was around 9:30 am, and a man was just breaking down his tent. 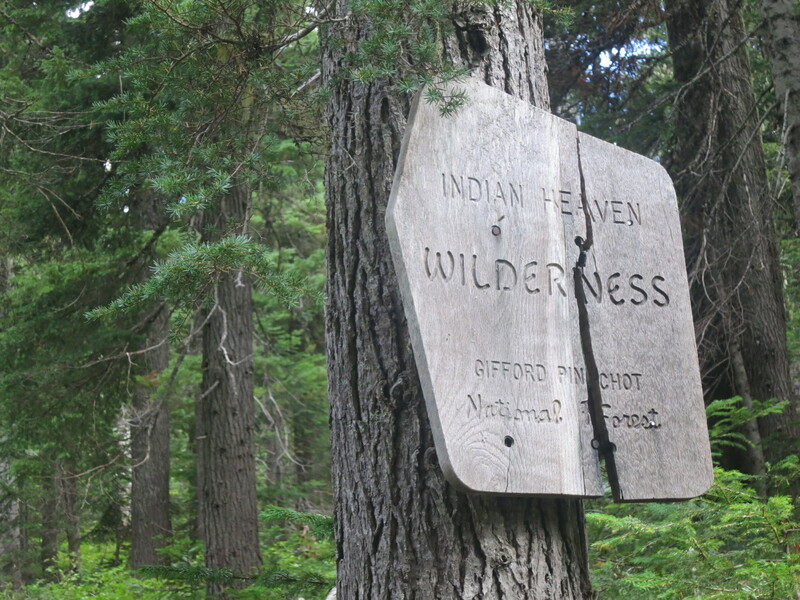 Once across the road, the trail climbed about 1500 feet. 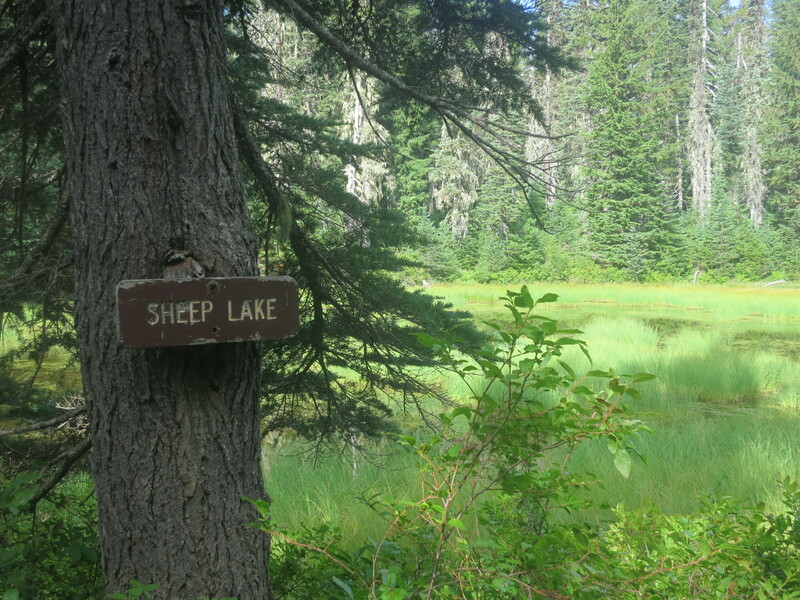 After a couple of miles, I passed by Sheep Lake, which my guidebook described as “gross, disgusting water”. It also seemed to be called “Duck Pond”. 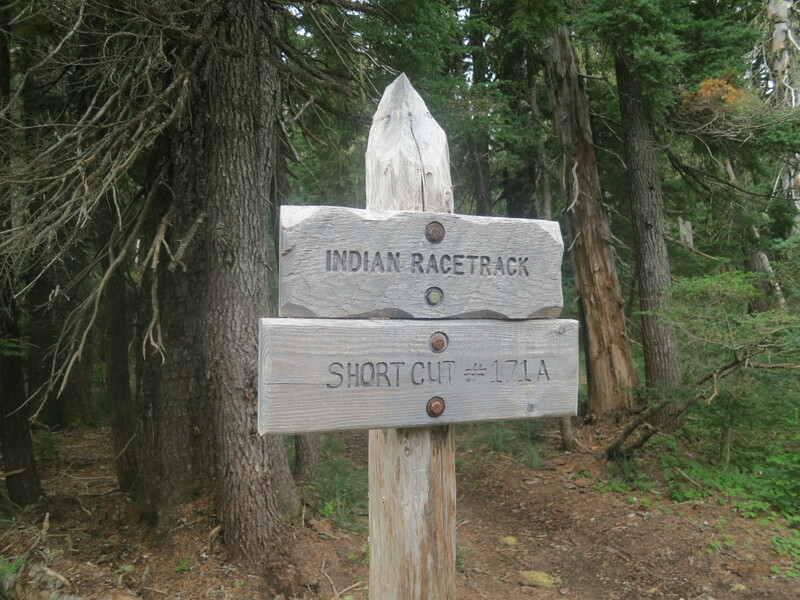 I continued to climb and found a sign that announced a shortcut, which seemed appealing. 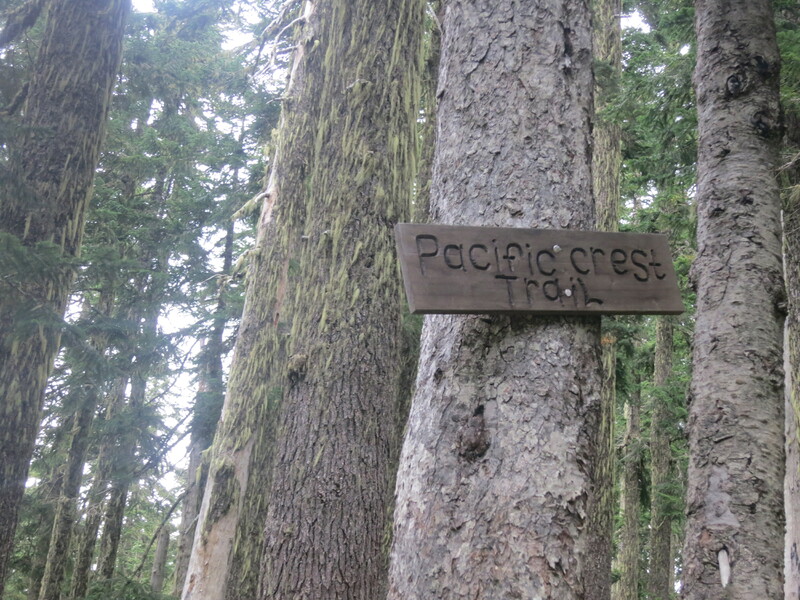 Not knowing where it actually went, I kept on the PCT. Just as I decided to take a break, the rain started coming down again! I hesitated and thought about continuing on, but then decided I needed a snack. I found a tree to sit under and since I was so cold, I boiled some water for my second cup of coffee. I found that I had reception and received a rare comment on my blog which gave my spirit a boost. It’s amazing what a few words can do! As I sat there, I heard some very loud voices approaching. A father and his three children eventually appeared and he apologized to me for the noise. He said he was giving them a botany lesson. They had been discussing the different colors of the berries along the trail and what the colors meant. 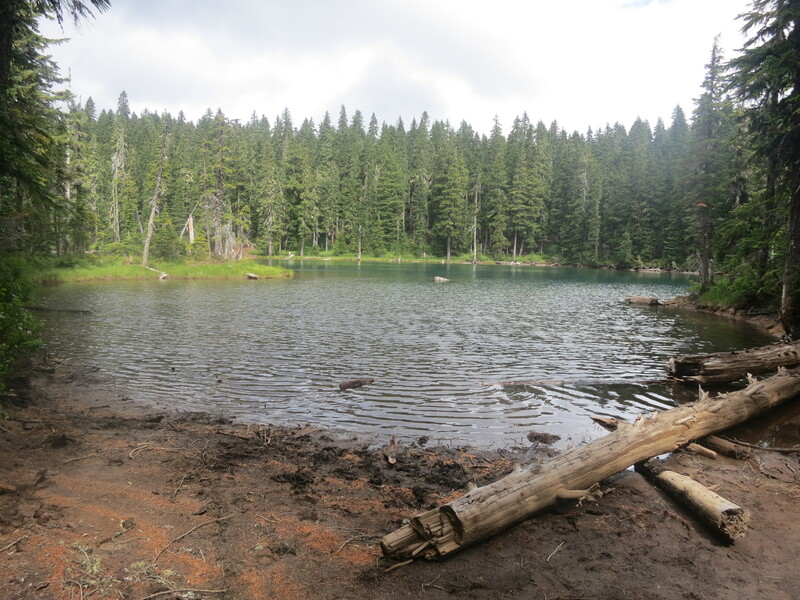 Although the rain was very unpleasant to hike in and the temperature was cold, the miles were fairly easy. I listened to my yoga playlist music, which helped me get my mind away from things that have been bothering me. I also ate a second Snickers bar again. So much of my food was inedible to me now- either because it was stale, or because I could no longer stand it. My diet was starting to consist mostly of chocolate and coffee. I planned on stopping at the tent site right after Mosquito Creek, but when I arrived, I saw Story Time and a woman who I couldn’t see very well already set up. The woman waved to me and I waved back and then kept walking. I hadn’t collected water at the creek, as I had planned on walking back to it after I had set up. Now, I wasn’t sure what I would find ahead. According to my guidebook, the next source was nearly three miles away. The rain started once again and my spirits sank. Fortunately, I came across a nicely running creek and was at least able to collect water for the night and morning. Now, I just had to find a place to sleep! Thick plant growth lined both sides of the trail. 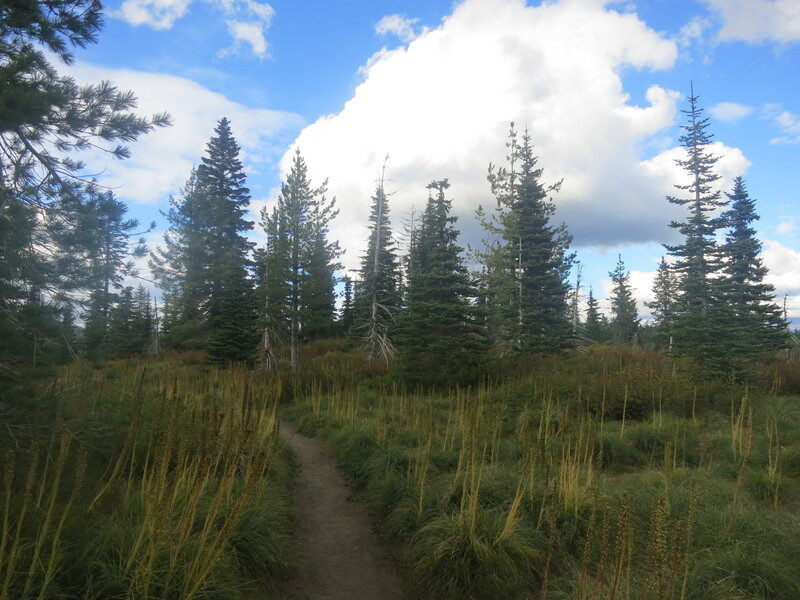 I bushwacked down the trail a bit to check out a potential area, but it turned out not to be suitable. 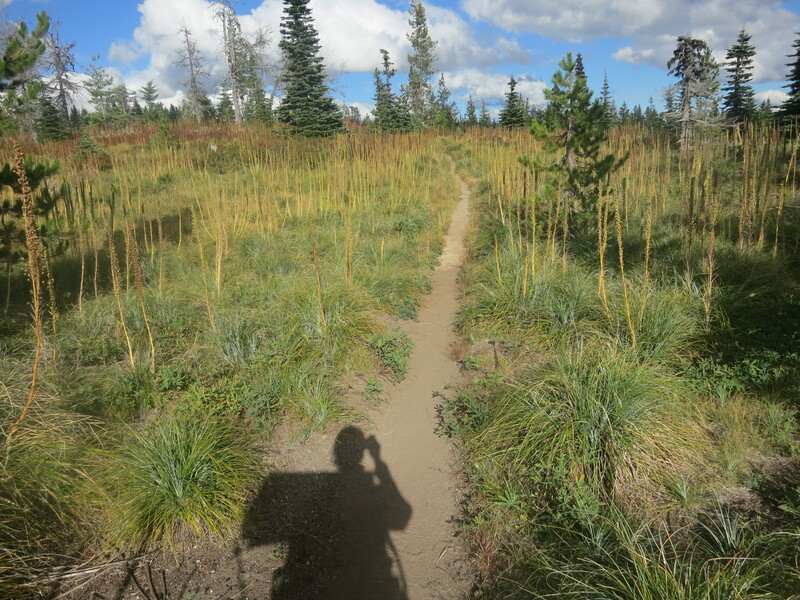 Later, I again went off the trail when the terrain flattened out. 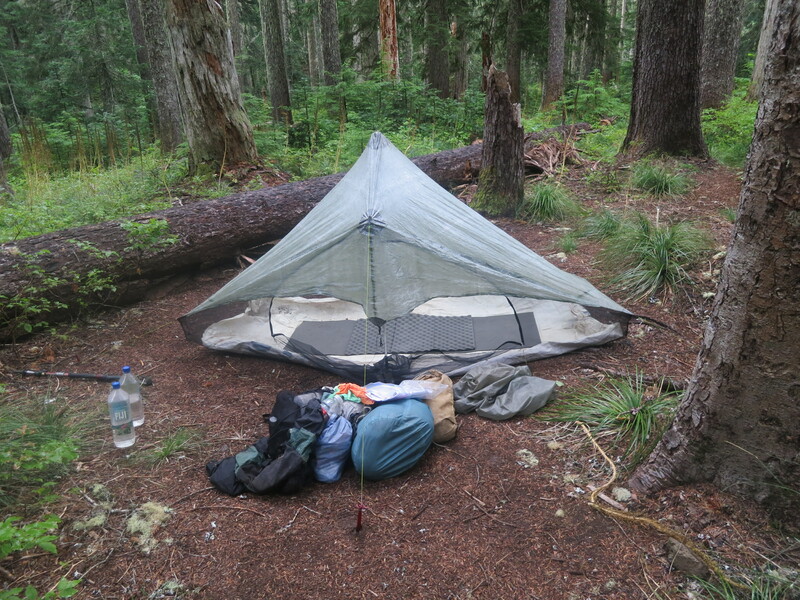 This time, I thought I could set up my tent in a small area in between some young spruce. It was now about 7:20. Again, I struggled immensely with my tent set-up. Knowing that it was going to be another wet night, I had to get it taut enough so the rain wouldn’t drip inside, but still be able to close my tent zipper. I cooked my dinner, washed up, and crawled into my sleeping bag. After another long and trying day, I finally closed my eyes. 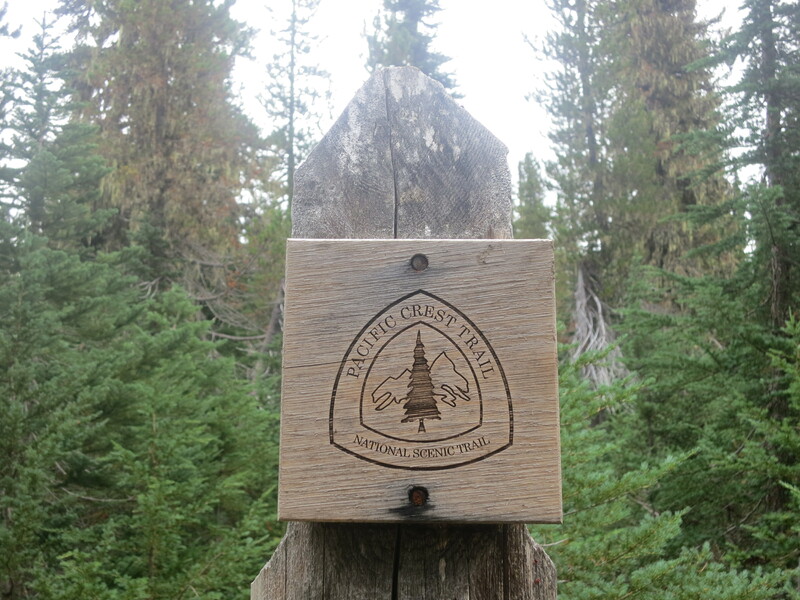 This entry was posted in Uncategorized and tagged Pacific Crest Trail, PCT, PCT 2013 blog, Washington by Wendy. Bookmark the permalink.